With inevitable urban sprawl subdivisions all the rage in the 1990’s and rapidly approaching forty thousand(40k) acres of rural farm land on the perimeter of Atlanta, Georgia. Local landowners banded together and decided to create their own grass roots comprehensive land development plan for a new type of urbanism community. Serving as a future land use model balancing urban sprawl and sustainability principals, utilizing land use strategies from rural land purchase for conservation, conservation easements, and implementing new urban growth principals, combined with high density development, the community of Serenbe, Georgia was the brainchild of Steve Nygren a retired multi unit restaurant owner. 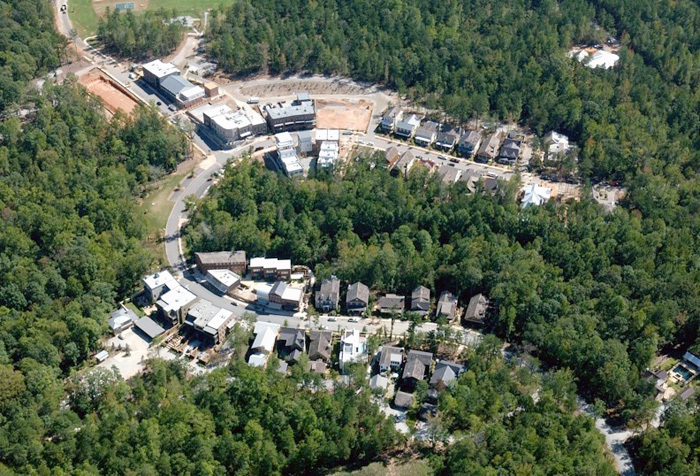 Serenbe construction started in 2004 and is now over a decade in development. Serenbe a Japanese coined word which means serenity and being, is a thousand (1K) acres of protected community developed on the perimeter of a major city with 70% of the land preserved as open greenfield. Constructed in Chattahoochee Hills, Georgia using the natural rural terrain of the undeveloped land as a guide to future land use. 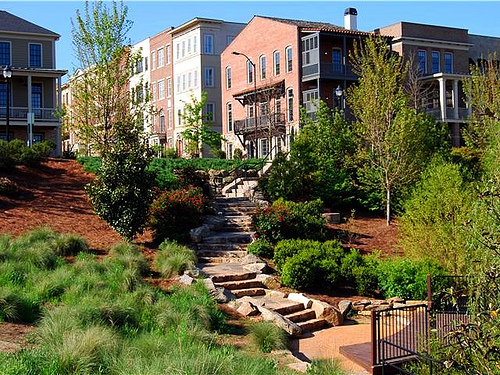 Each acre of Serenbe is carefully planned and fitted naturally into the terrain of the community. Each hamlet or small village has its own individual name and identity with residential and commercial development interconnected by roads and trails for ease of transportation and encourages walkability with dense mixed use communities at the center and less dense construction on the fringes of each hamlet leaving the local town. The first hamlet is called Selborne has a population of 265 and is focused on the arts movement. The downtown is filled with outdoor playhouse performances, art galleries, with frequent shows and concerts for local residents and visitors. The second hamlet is called Grange hamlet with a population of 185 and focuses on healthy food, a 25 acre organic farm with farm to table living. A local restaurant and coffee house lined by edible landscaping. With all new green construction designed and planned around keeping the local landscape natural. The thousands of remaining trees in Serenbe remove 1,400 tons of carbon a year and sequester the equivalent of 7,200 car emissions per year. All residential construction is thoughtfully designed in small clusters with front porches and no backyards. This encourages social engagement. Ninety percent of the sustainable homes in each hamlet back up to nature, this design encourages a Zen like environment. By thoroughly embracing sustainability principals in all aspects, the community of serenbe offers many unique features to future sustainable homeowners. Using the natural landscaping as green infrastructure, water conservation is integrated throughout the community utilizing natural reclaimed water for irrigation of vegetation fields, organic farms, and future grey water supply for toilet consumption. This allows Serenbe to consume 25% less water consumption than comparable communities. Recycling, composting, geothermal heating and cooling are integrated and used through out the serenbe community. Architectural diversity is an integral part of this green new urbanism community. Offering each family individual choices of sustainable living dwellings from cottages, town-homes, green condos, live work spaces including custom estates for the discriminating home family. Individual home prices range from the 300’s to over one million dollars and sell quickly with the intimate knowledge of the local greenbrokers. In 2016 Serenbe’s third planned village named Mado, a word meaning “things in balance” began construction. Mado is a future living lab of 380 green homes designed to be a multigenerational village/hamlet for entire families allowing aging in place, with mixed demographics, developed around a theme of “health and wellness” a growing trend. In the next 15 years 20% of the US population will be over the age of sixty five years old. Static’s show 85% these older adults prefer to live in their local community not traditional isolated assisted living. These new homes will be grouped around shared medicinal gardens, designed with step less entries, wider doorways, staircases, and hallways than conventional homes. Baths will include easy to reach towel bars with reinforced construction. Multiple heights countertops in the kitchen area. Through out the Mado hamlet the internet of things(IOT) will allow remote monitoring of residents health and wellness through connected wearable devices, GPS and sensors. Homes will be all shapes and sizes incorporating bright colors accounting for age and economic diversity. Since breaking ground in early 2016 30% of Mado’s 55 garden cottages and building lots have been presold! All of these designs and individual accolades has won Serenbe the 2008 Earth craft development of the year. In addition each individual home in the Serenbe green community has been constructed to the earth craft certified green building standard. Serenbe community includes a growing education system of schools, several town centers, organic grocery stores, gourmet restaurants, bazaars, concerts, yoga centers, Pilates studios, and community events to high light local talent and creativity. The local community Institute financially supports community events with a 1% property transfer tax on homes and a 3% property transfer tax on undeveloped lots. This are just a few of the many reasons more and more residents are calling Serenbe home for their families sustainable lifestyle! Glenwood park is a 28 acre brownfield redevelopment site. The site was a local neighborhood eyesore, used as a concrete recycling facility for decades, the entire site was covered by 40,000 cubic yards of concrete which was crushed, broken and buried on the site. Below the concrete was an additional 40,000 cubic yards of wood chips almost 40 feet deep All the woods chips were hauled away to the Alabama power plant and used as fuel. There were problems with a drainage ditch which had to be relocated requiring governmental approval. Once excavation began more than dozen storage tanks were uncovered on the site. Each one of the storage tanks were tested and no contamination was leaked into the sites soil samples. With all the myriad of problems with preliminary environmental clean up, excavation, rezoning and platting no bank debt was involved. Private investors financed the entire site ground preparation due to the amount of uncertainty and potential environmental issues. The specific location of the infill site was a primary factor of initial consideration. The site is located only one mile from downtown Georgia. Two miles from the local MARTA rail stops. Positioning Glenwood Park as a TOD community. Local MARTA buses arrive every 10 minutes, thereby reducing the need for each family to own a vehicle. The surrounding historic neighborhood was in full political support of brownfield redevelopment of this local eyesore. Lacking local retail stores, and facing declining property values the entire Glenwood Park redevelopment has lifted local residential values. All local neighbors have benefitted from this brownfield redevelopment. Green Street properties, the developer had the vision of implementing a new urbanism smart growth, walkable neighborhood including a public town square, tree lined streets, pocket parks with compatible residential and commercial development built to Earth craft green standards. After more than three years of site preparation, Whitehouse homes, Hedge wood properties and Capstone partners were invited as the initial green builders to create distinctive architectural designs for the pilot phase expansion of the Earth Craft community certification program. Glenwood Park is a national model of brownfield redevelopment. Showcasing an Earth Craft green community certification. Where everyone can lead a sustainable lifestyle and live to their highest potential!